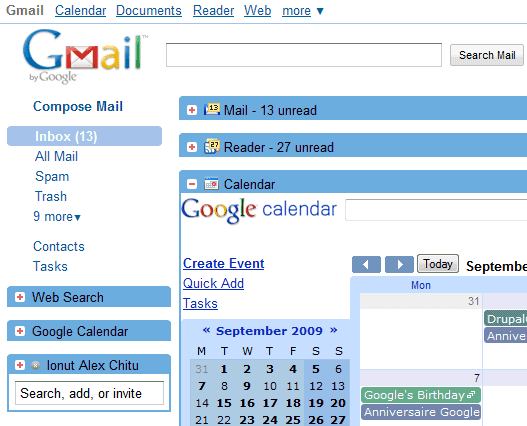 Integrated Gmail is a Firefox extension that adds Google Calendar and Google Reader to Gmail's interface. It's a simple way to switch between the three Google services without opening multiple tabs. The extension is customizable, so you can add other Google services, reorder them and delete the ones you don't use. The interface for each service loads in a collapsible box and it's preloaded when you open Gmail. You can add events or check your agenda while composing messages, read your feeds and chat with your friends from the same interface or copy some text from an email to a notebook. The extension is not perfect, it might slow down browsing, but it's an interesting experiment and a good starting point for an official unified interface for Google's services. iGoogle, Google's iPhone interface and the support for gadgets in Gmail show that this idea has a great potential. this is great, set it up for mail, reader, calendar, picasa and voice. thank you very much alex! I wish Google would make these cool Google-specific browser extensions for Chrome. Yes! I need this for Chrome! That looks like an awesome singular view for all the "google" tabs I have open anyway. The idea of the extension is great,i wish Gmail was like this by default,but having tried it,i'm afraid this add-on slows gmail/reader down to an absolute crawl for me. This Addon for Chrome? Isn't this addon trying to achieve the same as google wave does, at least for the already existing services? I now have my Gmail page with Integrated E-Mail adding my Google Calendar and Meebo. I thought Meebo might not like calendar/gmail editing because it would change the page, but Integrated Gmail treats each frame as its own, so it works great. I added the Chat on Right Lab item to get 2 columns of gadgets. Integrated Gmail allows me to move things around on those columns. Now I have chat on left, and G-marks igoogle gadget, Google Docs and Google web search Lab items. To make it look pretty I've customized the gmail interface and used a few stylish userstyles. braffe, from your screenshot: how did you get that i-google line on the top? Google should do that by default in Gmail !! This is indeed great idea to have calendar with our Gmail! Thanks for this informative blog!